Tomorrow, the consumers of the United States will make what will likely be their most important decision for the next four years. Americans will choose a new leader to guide them through an already economically troubling time. Today, there’s another twist happening in the election season, and it seems to be an overwhelmingly positive thing for the market. Today, we’ll talk about what has changed, what we’re seeing in the market, and what we can expect to see ahead. What’s Changed In The US Presidential Election? For the past 7 straight trading sessions, US markets have fell into the red as elections started to become more concerning. This was the result of a letter sent from James Comey, the Director of the FBI, to Congress with regard to the Hillary Clinton email scandal. According to the letter, the FBI had reopened their investigation into Clinton. Of course, this led to tremendous uncertainty and market declines. However, things are making a complete 180 once again. Recently, the FBI announced that it has closed its investigation into Hillary Clinton. 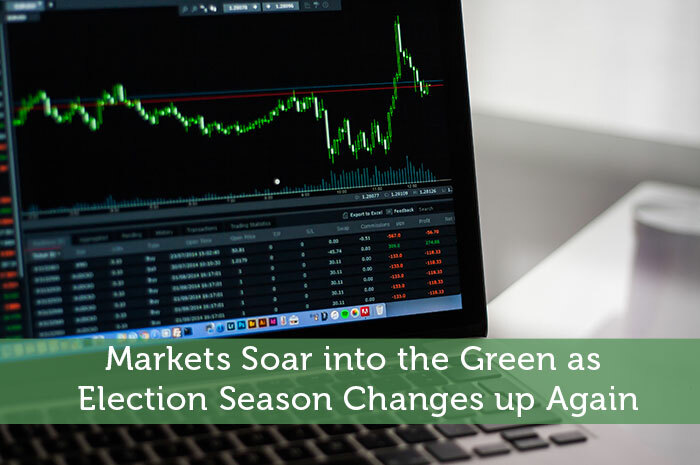 As soon as the markets opened this morning, they reacted in a positive way; with the first trading session largely in the green in the past week and a half. With the Federal investigation into Hillary Clinton now closed, much of the uncertainty in the market has dissipated. As a result, the market has room to run upward, and that’s exactly what we’re seeing. Currently (11:43) the Dow Jones Industrial Average, NASDAQ, and S&P 500 are trading at 18,215.12, 5,163.35, and 2,127.07 respectively. This comes after gains of 364.84 points, 116.98 points, and 41.89 points or 1.83%, 2.32%, and 2.01% respectively. Polls – One of the most important things I’ve noticed during this election season is that we’re seeing a clear correlation between poll performance and market performance. When Clinton is gaining in the polls, the market does better. Adversely, when Trump starts to chop away at electoral votes, we see declines in the markets. Surprises Are Everywhere – Just when you think you’ve got something figured out with this election, a new surprise emerges that seems to change everything. So, keep in mind that nothing is set in stone and that trading these trends profitably requires a very fluid trading strategy. Indices Aren’t The Only Opportunities – If you like trading indices, great! You’ve got some strong opportunities surrounding the Dow, NASDAQ, and S&P 500. However, these aren’t the only opportunities being created. The election is shifting just about all major assets from oil to gold, currencies, and small to large-cap stocks. What market opportunities are you paying attention to during this election season? Join the discussion in the comments below!